Ok, so I haven’t posted in a very, very long time & since then the Instant Pot has come into fashion. Fine. I’m on board & have a new rule for myself: keep the posts to the point, up the photo quality, & try to post at least once a month. 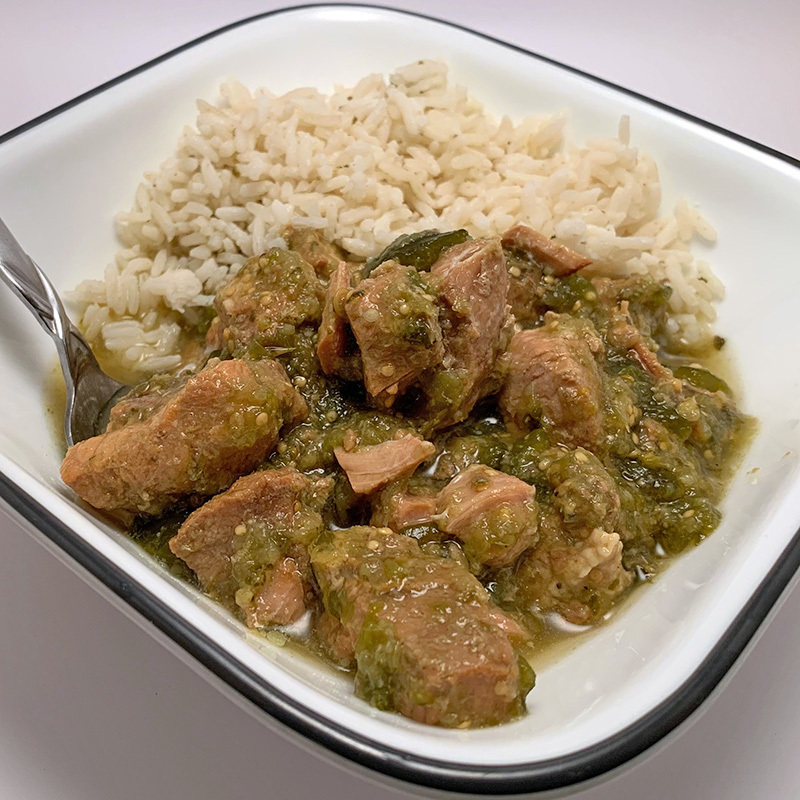 The pork verde may or may not have a lot of liquid, up to you how you use the dish on keeping liquid (such as, served over rice it nice to have a couple spoonfuls of liquid to pour over). This is pretty versatile, so go loco. A day late & dollar short, that kinda sums up this here blog. 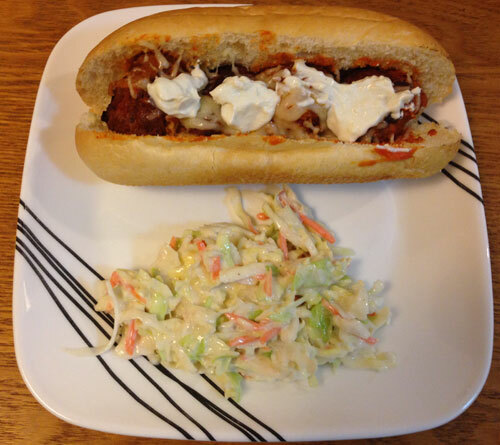 Made this concoction for the playoffs & it turned out way better than expected (I’m not one for the buffalo sauce). 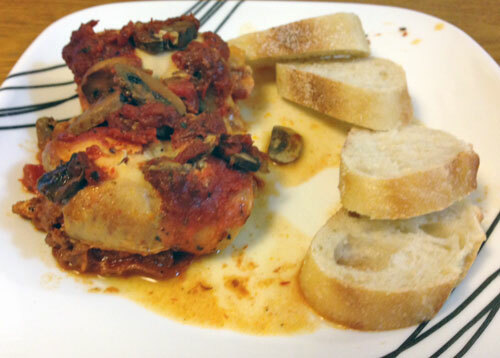 Surprised that I really couldn’t find a meatball recipe that didn’t involve frozen Italian meatballs from the store, so just somewhat had to wing it on that end. Really try to do mostly whole foods when making these crocks – sometimes it doesn’t work out that way. 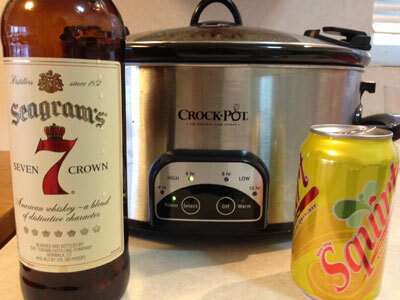 Crock on low for 6-8 hrs. 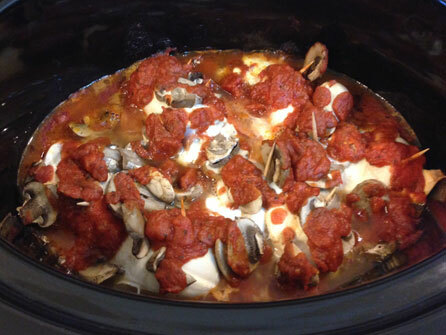 Yep, this is one of those amazing sportball slow cooker dishes. 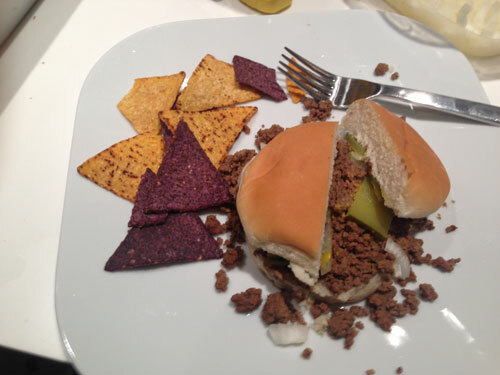 Just enough bad crap with some good mixed in there for good measure. Not scientific, but I believe taking out the frozen meatballs helps somewhat. 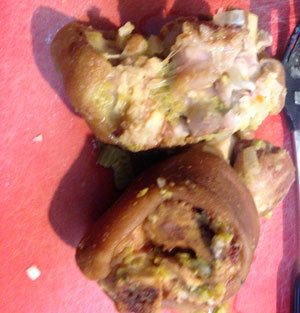 These were amazing – you could eat w/o the buns – so that is something. Great tasting main dish with the yogurt/blue cheese topping – you can eliminate if need be, but I wouldn’t suggest doing so. P.S. swear I’m going to learn how to take good photos of food – there is an art to it & obviously I don’t possess that skill. 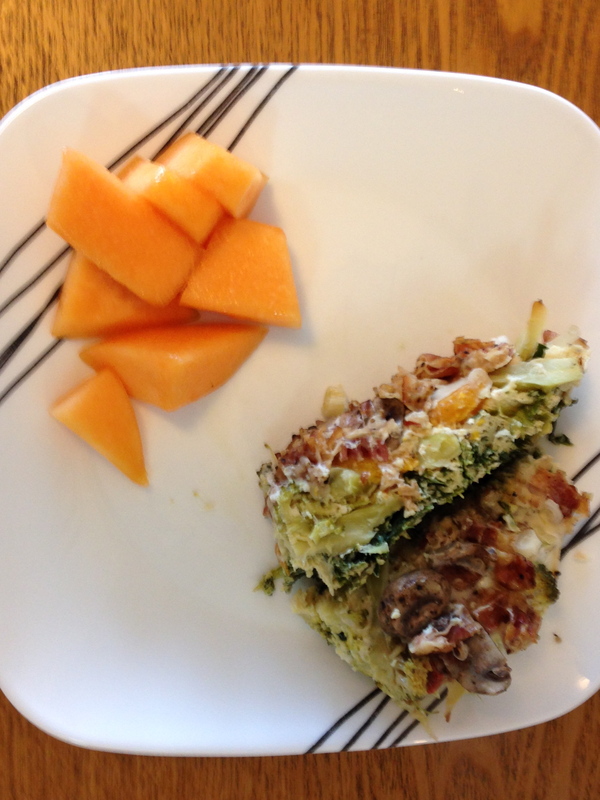 For football season I love to make some breakfast dishes – east coast games are sooooo early dammit. Breakfast dishes are difficult, so am always looking around for another way to make some eggs & whatnot – sorry, I’m just not an oatmeal or cinnamon roll person – I go savory all the way. If you want sugar, check Pinterest. Don’t get me wrong, Pinterest has up-voted one of my crocks quite a bit (thanks Sonja!). 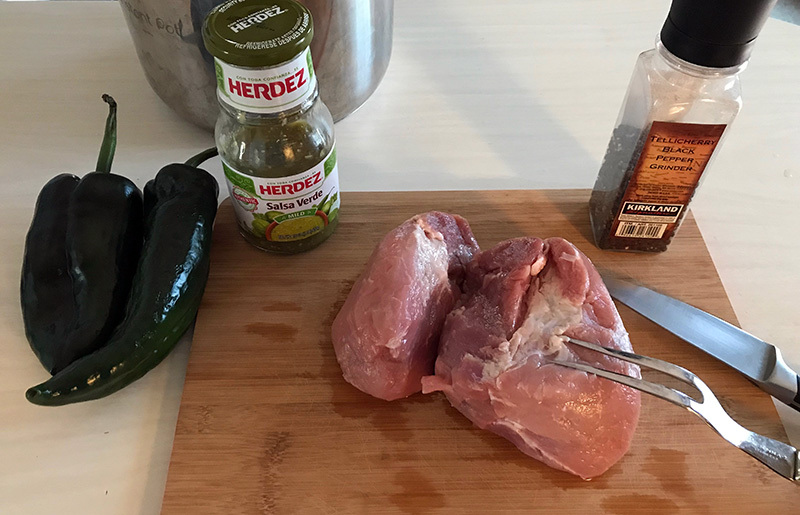 Cut the pork into 1 inch pieces (I used 4 lb shoulder & used rest for another crock), place in sealable bowl, add salsa & diced jalapeno – marinate in fridge overnight. Lightly grease crock with olive oil or use spray. Mix onion, potatoes, chile peppers, garlic & salt/pepper. Place pork marinade (from overnight) in bottom of crock & add in onion, potatoes, chile peppers, garlic & salt/pepper. Cook on HIGH for 3.5 hrs. 15 mins before serving – make 6 indentions in crock mixture & crack eggs into each indention (closer to edge cooks faster). Lightly shake the cheese over mixture, cover & cook. Make sure egg whites are solid or you can serve sooner if you like over easy… Serve with avocado slices on top & a crumpet! Wow, this dish was pretty amazing. Potato mixture came out just soft enough, but not too mushy (with crocks it is tough cause you can get a lot of moisture that might ruin the veggies). The eggs cooked way faster than I was expecting, but were eggcellent (see what I did there). 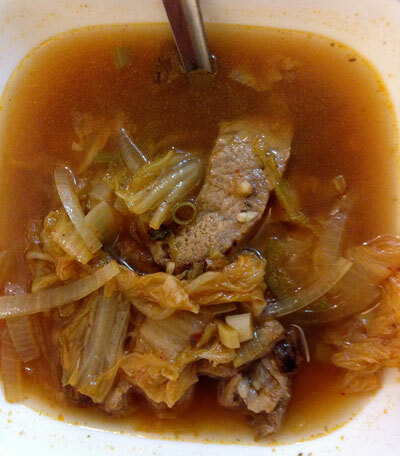 Lastly, the pork was so incredibly tender & had just the right amount of kick – I could use more kick, added some hot sauce. Avocado on top – great for a bit of cool & color. Done & done. 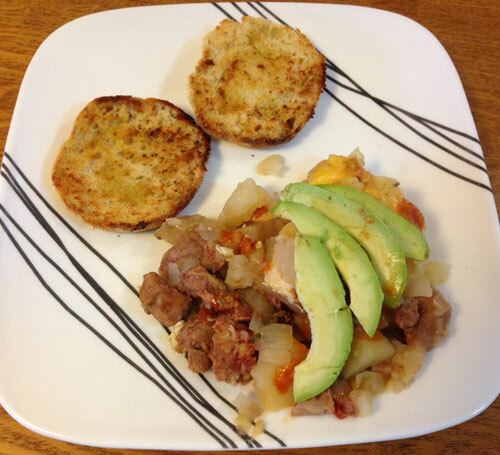 If you cook one of my breakfast crocks – try this one. 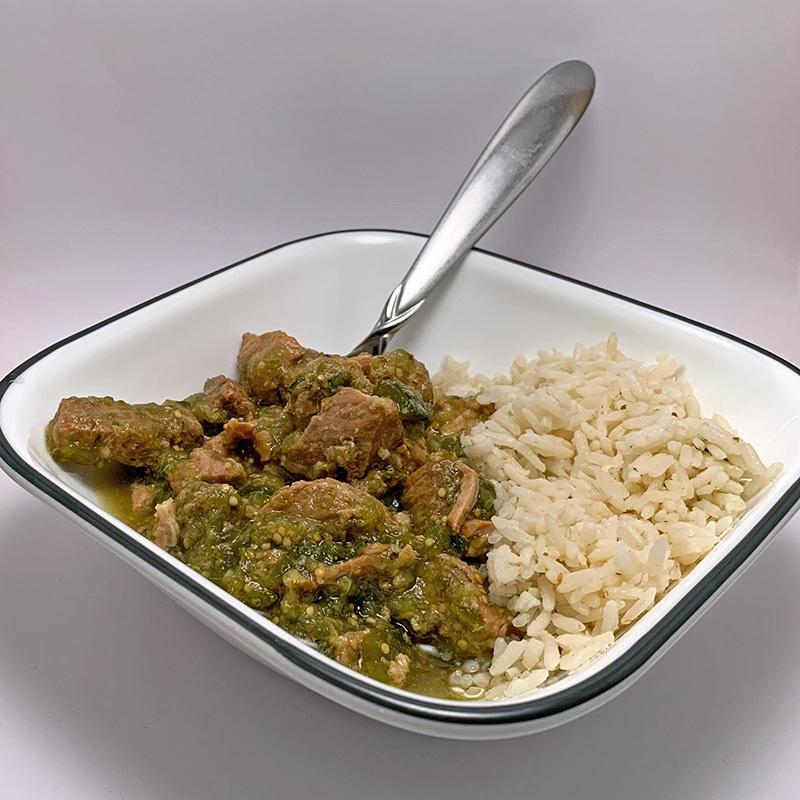 One final note: get everything ready the night before & that way you can just throw in the slow cooker early & go back to bed for a bit (unless you have kids, you’re on your own at that point). Ok, veggie folks who may have asked for at least one more crock – that I’m not being a complete carnivorous biped, here you go. Had a head of cauliflower & some other veggies that needed to be used up. So, thought I would look around a bit & see what could be made with the items that I had on hand. 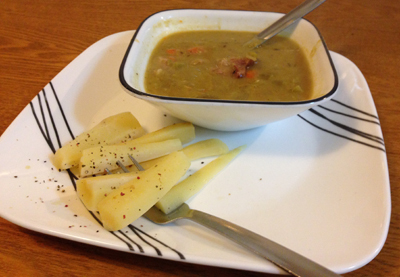 Haven’t been too successful with the veggie dishes so I was a bit worried that this one would go down the same. I was super happy with the end result. Heat oil in skillet over medium heat. Add onion and carrot – cover and cook until tender. 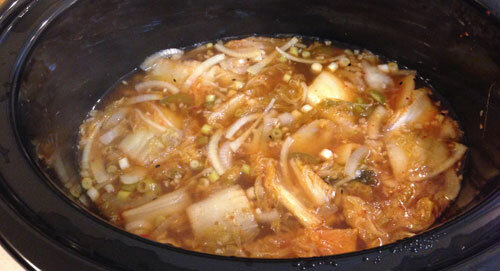 Add curry powder, ginger, garlic, and chile (add 1 tblsp of water – mixing curry powder) – cook for a minute or so. 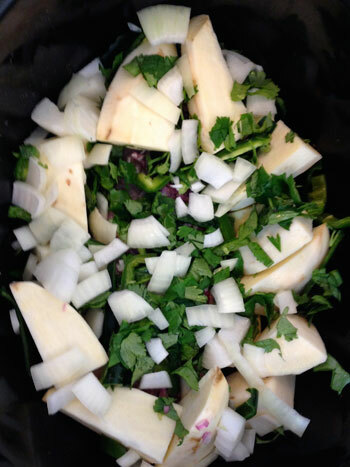 Dump onion mixture into slow cooker. Stir in chickpeas, salt/pepper, pepper flakes, tomatoes, broth & put the frozen green beans on top. Cook on HIGH 6 hrs or LOW 3 hrs. (I did the 3 hr method & think this works best so the veggies don’t get too soggy). Add spinach, basil & coconut milk about 15/30 mins before serving or until spinach wilts. 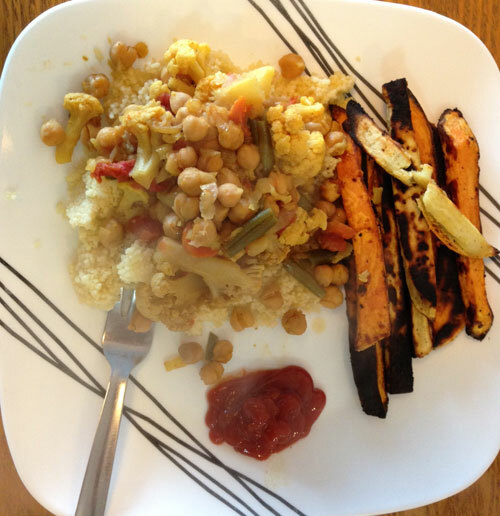 Serve over couscous & garnish with lemon wedges. Baked some sweet potato french fries (as you can see in photo – keep an eye on your fries or they’ll turn out a tad crispy!). As mentioned, this crock turned out pretty darn great – tons of flavor & the cauliflower came out fantastic & wasn’t mushy. 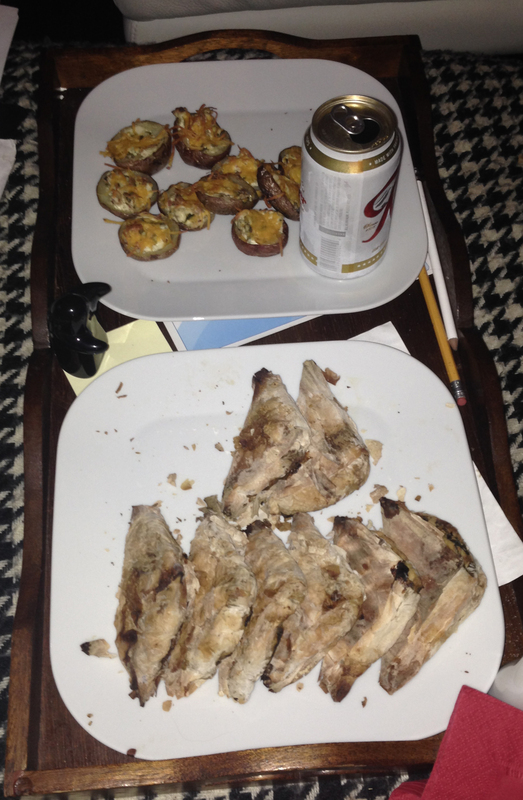 Got a 1.5lb pork loin – of course it was a manager special @ $3.50 (that is the way I roll). Couple days later went to the most intense farmers market ever – they shut it down because of natural disaster – wind bringing the tarp things down. Anyway, got the idea of crocking something with the fantastic peppers that I gathered at my peril. I hadn’t tried an actual pork loin in the crock & so was wondering how this was going to turn out. Crossed my hooves & hoped for the best. Put just a bit of olive oil on the bottom to lube it up. Add the pork loin in then surround with the potatoes & cover all of this with the peppers, cilantro & throw the pepper on top. This was damn good. The peppers added so much flavor to the pork & calmed down the sweetness of the sweet potatoes (which I mashed up in a bowl before serving). Not the prettiest looking dish, but so damn simple. Served with Romanesco broccoli steamed with lemon – I’d never had this type of broccoli. 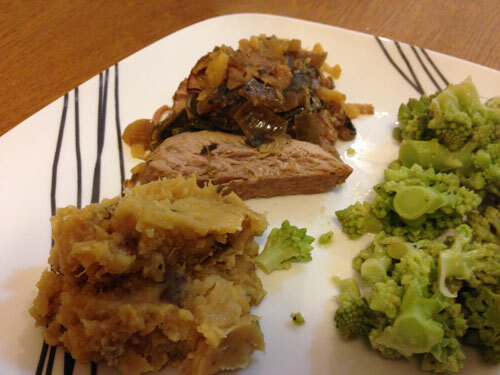 Liked the fact that it was more hearty than normal broccoli & so doesn’t get mushy. 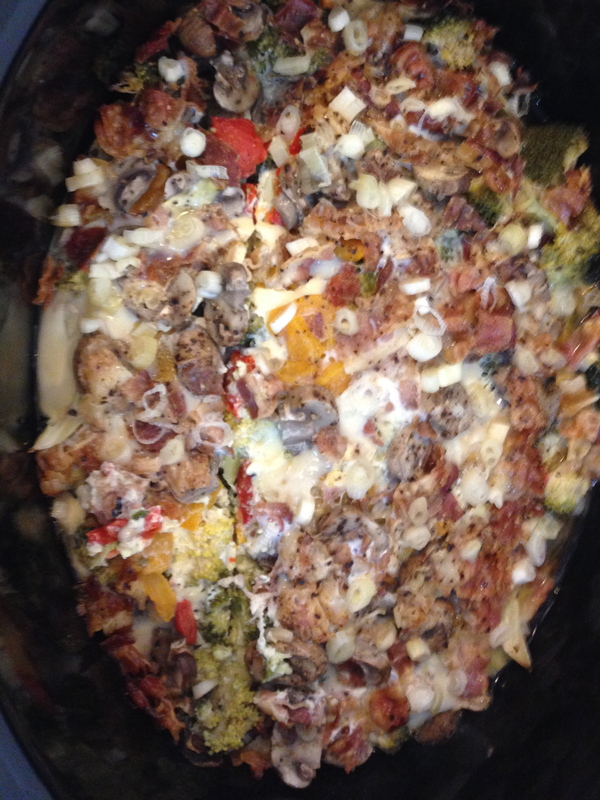 Have done some other breakfast crocks, but wanted to do a bit lighter one – a nice frittata like substance. Somewhat similar to an omelette, so I thought it would be a good change from the ones I’ve made before that have a bag of hash browns. 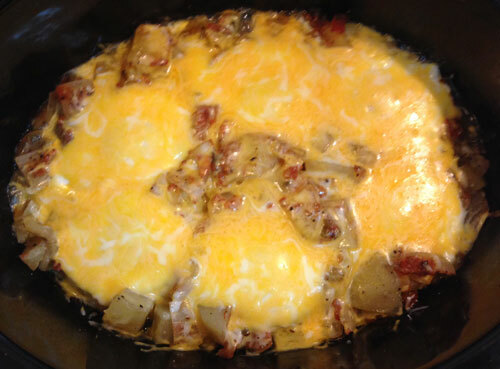 This is a fantastic breakfast dish that can feed 4 people & only takes about 3 to 4 hrs to cook. Sauté the onions & garlic & throw the leeks in at just the last minute of sautéing. Spray the inside of crock with some cooking spray. Beat the eggs up real good, pour into the crock. Dump the rest of the ingredients in spreading out evenly. Cook on low for 3 to 4 hours – check to make sure the the eggs have cooked thoroughly. Verdict: was quite surprised with this one, cooked up very light & with great flavor. Didn’t use the cheese, but you can & I’m sure that it will up the taste. Great for an early game day or lazy Sunday. P.S. 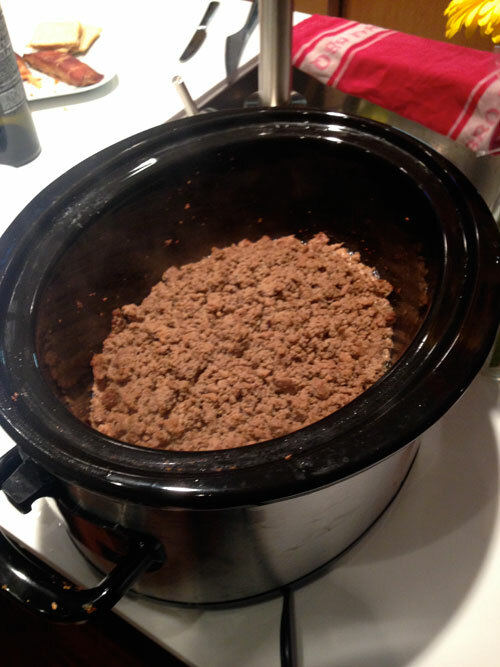 – R.I.P my old crock pot that died 10/26/2013 – you will be missed. Now I have a brand new 7 qt cook & carry – invite me now, NOW, to your holiday party: dishes & dips will be brought!